Home » Aqua Master Online » Eugene “Gene” Albert Mielke Jr.
Gene Mielke, 69, died October 28, 2015, at Providence Portland Medical Center in Portland, Oregon. Gene had knee replacement surgery the day before his death. Gene was born in Visalia, California, married Karen Lee Ragle in 1968, then moved to San Luis Obispo so he could continue his education at Cal Poly. After Cal Poly, they moved to East Lansing, Michigan, where he received his Ph.D. in pomology (the science that deals with fruits and fruit growing) from Michigan State University. In 1975 they moved to Tucson, Arizona, where Gene taught some classes at the University of Arizona and helped encourage the growing of wine grapes and making wine. While there, he collected many bottles of wine. In 1984 they moved once again, to Hood River, and Gene became superintendent of the Experiment Station. Their moving van had a cooler in it to keep the wine at a constant temperature. The van was stored in the basement of the house at the Experiment Station until Gene and Karen moved into their current home, in which Gene built a wine cellar. While in Tucson, Gene became very interested in ham radio. He continued his passion of ham radio and after moving to Hood River, became involved with the Radio Amateurs of the Gorge (RAGs). Since 1984, Gene and RAGs have been a vital part in the Cross-Channel Swim, making sure all swimmers are safe and accounted for. 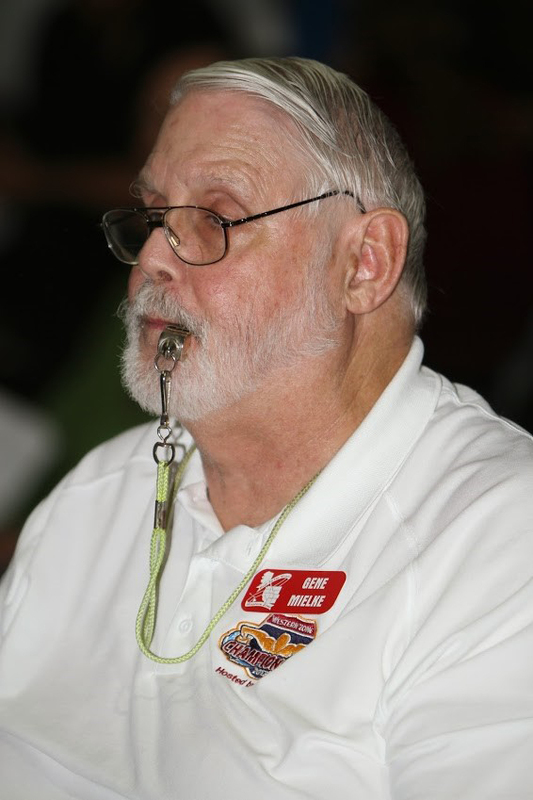 Once his son became involved with the Hood River Valley Swim Team, Gene became involved in officiating. At first it was just the local level, but with time, he officiated at state championship meets and western zone meets. He was also involved in officiating at Paralympic meets across the United States. Gene was very tender-hearted and generous. He was always willing to help others, even at a moment’s notice. He encouraged everyone to be the best person they could be, and he always stood up and did the right thing, even if it wasn’t the “popular” thing to do. Gene was a long-time official for Oregon Masters meets and for National and International Masters events held in the Pacific Northwest. 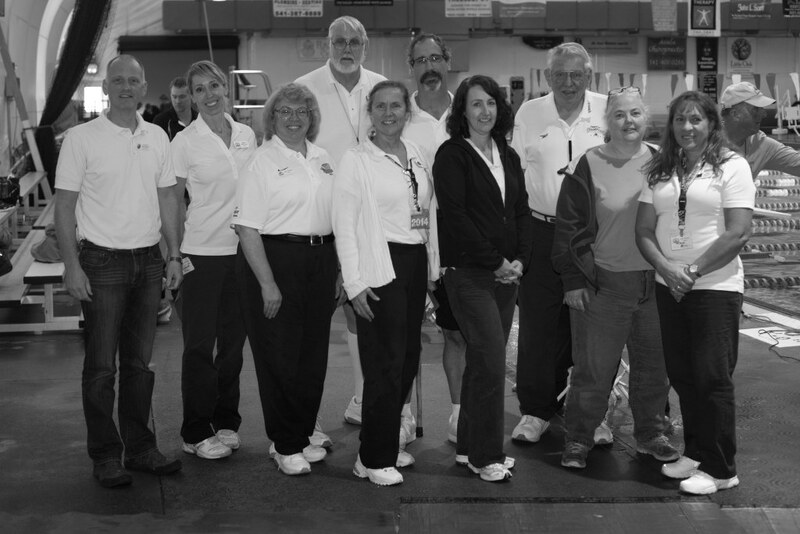 He gave so much of himself to OMS, that, in 2014, he was awarded a USA-Swimming lifetime membership from OMS and was recognized in the November/December, 2014, issue of the “Aqua Master”. The award was presented at a session of the USA-Swimming House of Delegates in Jacksonville, Florida. Gene was totally surprised and very pleased at receiving the award. Since USA Swimming membership is required for OMS officials, this award was a great benefit to Gene. Gene created many long-lasting friendships in both his professional and personal life and will be greatly missed by everyone who knew him. Gene has been a mainstay as an official in our Oregon Masters Swimming world for years, has worked at our USMS National Championships held in Oregon for as long as I can remember, and was always the guy who showed up for our local high school meets here in Hood River. He will be sorely missed. Gene was such a wonderful person and an absolute pleasure to have on deck at swim meets. Gene had been officiating since I was a little kid and I will always remember him. He (Gene) was a wonderful man and so full of life. We all will miss his presence and knowledge in meets to come. Well, said, we will all miss Gene Mielke. Gene was an official at the first OMS meet I swam in, in 1995 at Oregon City. (He disqualified me in the 200 breast for a dolphin kick during the pullout – now legal) Over the years, I have seen him an many OMS meets, and had the pleasure to work with him as an official. We became good friends and have shared many evenings after the meet was over. Jacki and I stayed with Gene and Karen when we were in Hood River, and we sampled a few bottles of vintage wine and told stories. He was a big man in many ways, but he was gentle and caring and always ready to pitch in and help. We miss you Gene. Gene had such a big heart and was such a kind and gentle soul. I will never forget him. At swim meets he would always encourage me, which helped me a lot especially when my fly usually was my first event at ever meet and that was the stroke that always made me nervous but he always managed to say something that calmed me down and made me feel good about myself at the end of the heat!! You will be missed by not just me but all of those whose path you crossed during your life. You were awesome!! My heart felt condolences to his family and many friends! 1999 Federal Way. Working my way through a 1,000 swim. Flipped too short at the far bulkhead..no touch. Came up from the flip and Dear Gene was standing there with the most friendly smile I have ever seen. That’s all; just the smile. No DQ, no pencil and paper; just a genuine, kind, smile. OOPS! of course repeated the flip all within fractions of a second. This time with a push off. Over the years I found it was so easy to chat with Gene; he always had time for a kind word or a smile when I reminded him of this memory in Federal Way. His personality was so easy and friendly and so genuine. I often told him how I appreciated someone caring about me. I will never ever forget that moment in my life; the split second of a camera shutter. I can see him even this minute looking down on me with his smile. Each swim meet I always looked around on deck to make sure Gene was there. Like coming home.